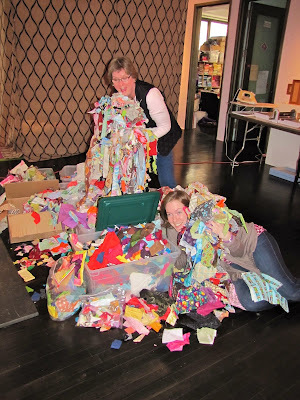 Canton Village Quilt Works | A Scrapbusting Retreat! I just arrived home last night from a wonderful weekend at Victoria's. 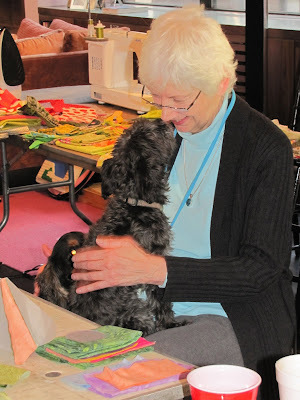 We relaxed, ate, chatted, laughed, and sewed until our hearts were content. We came from near and far to be with Victoria for this fun filled weekend. Here we are, our entire group... minus me (I am taking the photo). But you can see another photo with me in it over at Victoria's. Kim and Jessica really getting into those scraps! We all came with some to add to the mix, but Victoria was the winner... she had the most scraps by far. Andrea arranging her beautiful blocks. She finished this quilt by the weeks end. I love this and Andrea knows it! My kind of colors. Helen taking a break with her new furry friends. They really wanted to see what she was doing. Karen was buried in fabric all weekend. 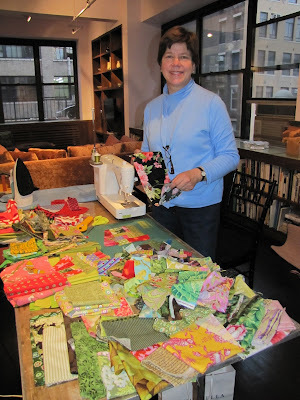 Lots of greens and wait until you see what she made. Man was she prolific. Kim stopped in for the night on Friday and brought some handwork. LeeAnn spent the weekend sewing HST's. Bonnie sat next to LeeAnn and is in the first picture. Not sure why I don't have a picture of her here. Aren't they wonderful? Victoria was just tickled. I am so excited to see what she will do with them. I know whatever it is, it will be terrific!! My block is the tall, skinny skyscraper on the left side. Oh, and if you have a minute... check out who I am blogging for now by clicking here. Please say hello and leave me a comment!